Tobacco comes from the leaves of the tobacco plant. It contains a drug called nicotine which is highly addictive. It's nicotine that gives smokers their 'hit'. Smoking any drug gets it to the brain quickly. When a smoker inhales, the nicotine reaches the brain in around 8 seconds. Regular smokers say it helps them relax and feel less hungry. Nicotine is a highly addictive drug. Smokers can get hooked very quickly and it can take years and a huge effort to kick the habit. Not many people are able to remain occasional smokers. The leaves of the tobacco plant are dried then rubbed to produce a brown, flaky mixture. 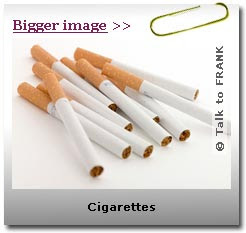 It can be bought loose as rolling tobacco or in ready-made cigarettes. Tobacco is most often smoked but some people chew it. Tobacco contains over 400 chemicals. Many of them are known to do nasty things to the human body. *Nicotine speeds up the heart rate and increases blood pressure. * First time smokers often feel sick and dizzy. * Smokers are more likely to get coughs and chest infections. * Long-term addiction could leave you with cancer, emphysema (related to your lungs) or heart disease. *Smoking has been linked to the amputation of 2,000 limbs a year. * Other people breathing in your smoke could end up with breathing difficulties, asthma or even cancer.